Kendra Fershee (left), Talley Sergent and Carol Miller are all running for seats in Congress to represent West Virginia, joining a national surge of female candidates across the country. West Virginians don’t vote for women. Democratic candidate in West Virginia’s 1st Congressional District Kendra Fershee says that’s what a man told her on the campaign trail before the primary election in May of this year. “[He] encouraged me to drop out of the race because I’m a woman, said I won’t be able to win because people won’t vote for me,” Fershee recalled. 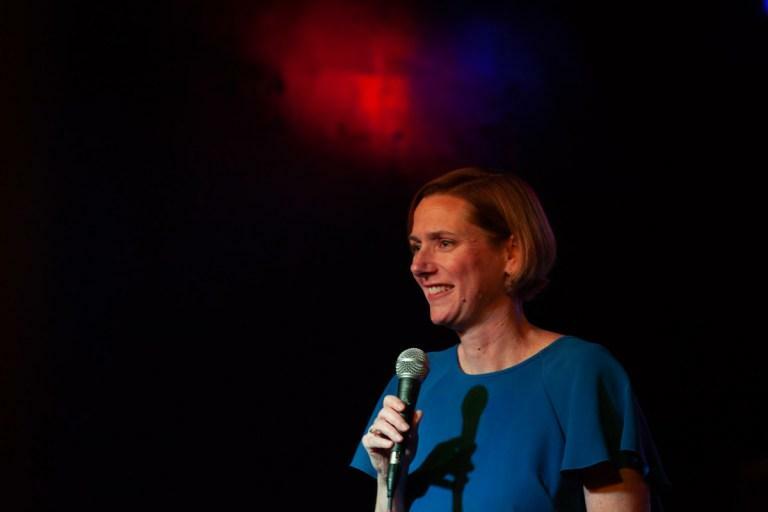 Kendra Fershee, the Democratic nominee for West Virginia’s 1st Congressional District, speaks at a candidate event in Morgantown, West Virginia, in October. From a historical perspective, the gentleman isn’t necessarily wrong. West Virginians have only sent two women to Washington to serve in the U.S. House of Representatives. Sen. Shelley Moore Capito served in the House from 2001 to 2015 before taking her current seat in the Senate and Elizabeth Kee represented the state from 1951 to 1965. Kee was elected to the position six times after her husband, who served in the position from 1933 to 1951, died. But unlike this gentleman predicted, when it comes to Fershee, the people did vote for her. In fact, in all three of the state’s Congressional districts, West Virginians will be able to vote for a woman on November 6. In this second “Year of the Woman,” West Virginia could join the nation in voting more women into office. Political pundits deemed 1992 the first “Year of the Woman.” The year before, a Congressional panel of white men questioned Anita Hill, an African American law professor, over allegations of sexual harassment against then-Supreme Court nominee, now Justice Clarence Thomas. Following the elections that year, the number of women holding a seat in Congress increased by two thirds, according to the Center for American Women and Politics at Rutgers University. This year, CAWP data shows 235 women are on the ballot for a seat in the U.S. House and another 22 for Senate, a drastic increase over previous elections. A majority of those candidates are Democrats, like Fershee, and their ability to follow through with a general election win could mean major changes for the nation’s political priorities. A screenshot of the data from the Center for American Women in Politics. Historically, though, there have been a number of barriers for women running for office. CAWP studies have shown that politically minded women tend to come from careers where they make less money, like teaching or social work, so not only do they lack the independent wealth, but they also lack a network of wealthy friends to help fund their campaigns. Women are still seen as the primary caregivers for their families, so female candidates with children have had trouble winning elections in the past, and it typically takes being asked for a woman to step into a race. But in 2018, CAWP’s Associate Director Jean Sinzdak says all of those things are changing. And the West Virginia women running for Congress prove it. Kendra Fershee never thought she would run for office, but after the 2016 election, she wanted to see new and more relatable leadership in her state and in her country. So, she tried to convince women who were active in her community to run for office. 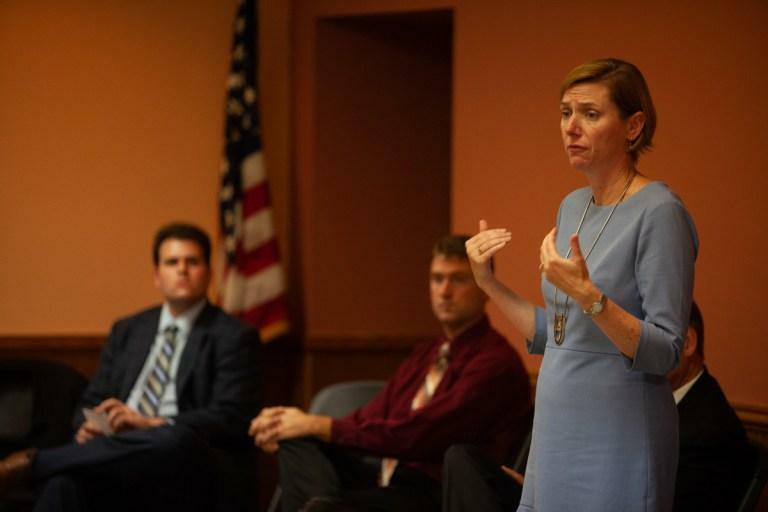 Candidate for West Virginia’s 1st Congressional District Kendra Fershee attended a candidate forum in Grafton, West Virginia, on Oct. 16 to speak with local voters. The sentiment was met with hesitation when Fershee thought about her responsibilities as a mother and as a law professor at West Virginia University. She said she discussed the possibility with her husband and fretted over the impact to her family. Over the course of her campaign, Fershee has not only embraced, but emphasized her identity as a mother. She believes that as a mom, she is in tune with what is going on in her community, especially in schools, and it helped her relate to a wide population of working West Virginia women. “Moms do hard things and we need more moms and we need more moms doing hard things,” Fershee said. That message, of being a hardworking mother, it’s being used in campaigns across the country this election cycle. Women have traditionally tried to downplay their role as a mother, Sinzdak said, but women in 2018 are using motherhood as an asset. Talley Sergent isn’t exactly a political outsider. The Democratic candidate in West Virginia’s 2nd Congressional District, Sergent has experience working for former U.S. Sen. Jay Rockefeller, the U.S. State Department and chaired Hillary Clinton’s 2016 campaign for president in West Virginia. But when she decided to run for Congress, Sergent said she didn’t have the support of the national Democratic Party. “Nobody asked me to run to be quite honest,” Sergent said, and, according to Sinzdak, that usually makes a difference when it comes to women running for office. 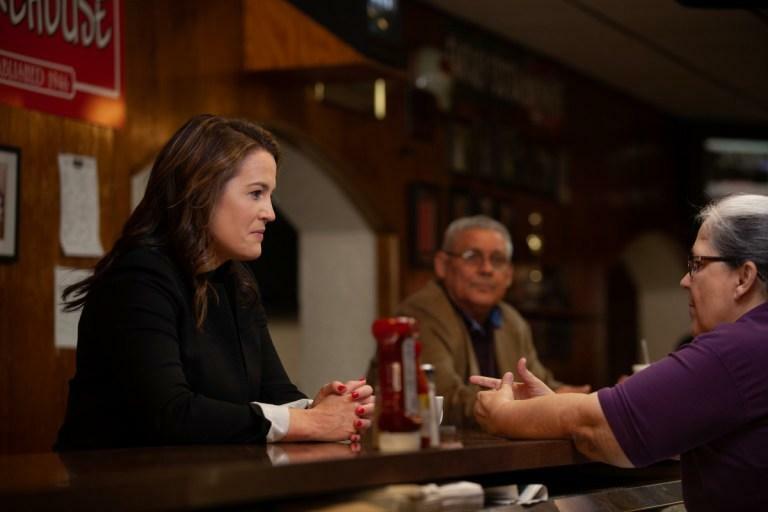 Candidate for the West Virginia 2nd Congressional District Talley Sergent speaks sits at a lunch counter at the Smokehouse in Charleston, West Virginia, speaking to a potential voter who works in the restaurant. CAWP research has proven that women will enter a political race in much higher numbers when they are asked to by a political influencer– an elected official or political party representative– but for men, being asked matters very little. But where Sergent does conform to the traditional mold of female candidates is in her passion for creating change in one specific policy area: health care. “Right now, the American healthcare system is under an all-out assault by the Congress. [The U.S. House] voted over 50 times to repeal the Affordable Care Act that would take away some protections for people with pre-existing conditions and would actually hurt West Virginia more than any other state,” Sergent said. Aside from her focus on fixing the nation’s health care system, Sergent has also put an emphasis on bi-partisan politics as she campaigns through the state’s largest geographic district, which stretches from the banks of the Ohio River in Jackson County across to the tip of the Eastern Panhandle. She believes politicians in Washington put too much focus on driving a specific party’s political agenda and not enough on the real issues, but when it comes to Pres. Trump, Sergent said she will work with him. “If Donald Trump is doing right by West Virginia, I will support that. If he’s not, you better believe I’m going to stand up to him like any other West Virginia woman would,” Sergent said. 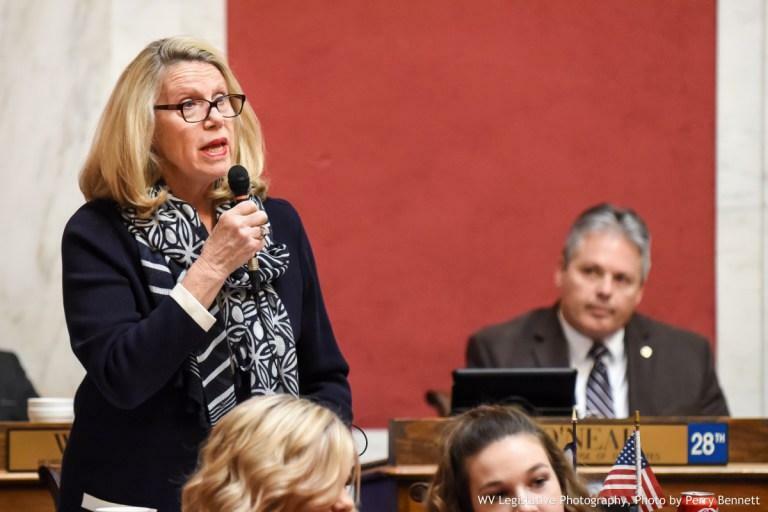 In as much as Sergent’s name is known in West Virginia’s Democratic political circles, so is the name of Carol Miller, except on the Republican side of the aisle. Del. Carol Miller, Republican candidate for West Virginia’s 3rd Congressional District, speaks on the floor of the West Virginia House of Delegates. From Huntington, Miller is a member of the West Virginia House of Delegates, a seat she held for 10 years before deciding to run in West Virginia’s 3rd Congressional District. Miller has held leadership positions at the state level within her party, having chaired the West Virginia House of Delegates’ Committee on Small Business, Entrepreneurship and Economic Development and served as both the Assistant Majority Leader and Majority Whip, positions of influence in the chamber. On her campaign website, Miller writes she’s running for Congress “to support West Virginia values and support President Trump,” but she has rarely given interviews or made public speeches during her campaign. Of the three women running for Congressional seats on West Virginia’s general election ballot, Miller is the only one who has run for office before, she’s the only one not challenging an incumbent Congressman and she’s the only Republican. But in a year where a historic number of women are running for office, a majority of those women don’t have a lot in common with Miller when it comes to political stances. Just 52 Republican women are running for Congress of the 235 on the ballot. Sinzdak said that could be because of motivation, but also because the majority party tends to back its already seated incumbents, therefore, more Democratic women are stepping up to run against male Congressmen already holding their seats. But, according to Sinzdak, it also has to do with representation within the party’s themselves. “Democratic women far outpace Republican women in terms of their representation within their party’s caucus, and that’s been a trend that’s been going on for a long time,” Sinzdak said. Despite the challenges they may face on the campaign trail, Sinzdak said voters will choose women just as often as they do men when they actually put their names on the ballot. And aside from having a government that is demographically representative of our country, Sinzdak said there are some great outcomes when women are elected. Women are also more likely to reach across party lines and attempt to build consensus, “which is something that we all really need more than ever these days,” Sinzdak added. Updated: Monday, November 5, 2018 at 3:00 p.m.
A group encouraging West Virginia voters to reject a constitutional amendment on the Nov. 6 ballot has filed a complaint with Secretary of State Mac Warner. The complaint, rooted in free speech issues and the state’s electioneering laws, comes after an incident Saturday at an early voting location in Morgantown. A poll worker asked Vote No on Amendment 1 volunteer Stacy North to stay at least 100 feet from the entrance of the Mountaineer Mall early voting location to comply with state law, West Virginia Code Section 3-9-9. Two prominent Republican politicians are among a pack of attorneys and judges competing Tuesday for a pair of West Virginia Supreme Court positions vacated by justices caught up in a scandal over spending by the court. Shortly after the teacher strike, Andrew Thomas stood before his fifth-grade social studies class at Mullens Middle School in Wyoming County, lowered the lights and showed his students a video of state Sen. Richard Ojeda. On this West Virginia Morning, there are two constitutional amendments on the ballot in this year’s mid-term election. If passed, one would change language about how abortions are handled in the state constitution. The other would give the state Legislature some oversight of the Supreme Court’s budget. Senior reporter Dave Mistich sat down with news director Jesse Wright to break down what each amendment means.